Shinnittsu participates in “Fun to Share” through energy-savings in the office, reducing the amount of fuel used in company vehicles, reducing the amount of trash generated, and reducing power usage during installation jobs. We propose the adoption of environmental considerations and eco friendly products to prevent global warming. And we contribute to the realization of a sustainable low-carbon society. We strive for customer satisfaction through installations taking into consideration the environment and safety. Promoting the 5S campaign (standing for Seiri -- orderliness, Seiton -- neatness & tidiness, Seiso -- cleaning, Seiketsu -- cleanliness, and Shitsuke -- good manners) together with our policy of placing safety first, our goal is to create a safety management system where we strive to continue and improve our efforts into securing safety through efficient and rapid PDCA cycles. 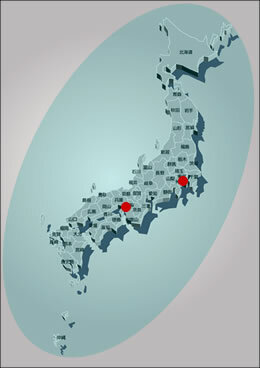 Offices in Kinki, Tokyo and throughout Japan ! Inquire via e-mail or online form. We visit and survey the customer's site for our estimate. Our customer receives our estimate and detailed explanation. Our customer issues a work order and we schedule the work. Our installer visits the customer and proceeds with the installation. After we complete the installation, we issue an installation certificate. During our warranty period, we will deal with post-installation problems without extra charge. We issue warranties for all installations after completion regardless of size. The warranty is good for three months after completion of the installation and we will service free of charge any problem that develops during this time. This warranty only covers the cost of materials, onsite service, and labor related to the installation. If you're looking for an installer, rest assured that you can rely on our quality after-sales service support. We are a telecommunication installation company based in Osaka and Tokyo. Our services include the installation of telephone network, LAN, fiber optic cable, electrical and security systems. including LAN, telephone, fiber optic cable, and electrical systems. We provide security and eco friendly solutions. Feel free to contact us. Please print the following form (PDF file), supply the information you have available and then send it to us by facsimile. We have been authorized by the Japan Information Processing Development Corporation (JIPDEC) to use the privacy mark. For all inquiries in English, please use the contact form or send us an e-mail.